Think about it: how much content is there for 4K TVs right now? Not a whole lot. That’s to say nothing of 8K TVs, whose content pretty much consists of demo footage created by TV manufacturers and standards bodies. 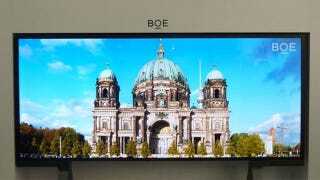 BOE’s display is technically just an 8K display with a few thousand extra pixels crammed on either side. Unless you really love that 10k timelapse video we posted awhile back, there’s just not much you can do with this screen. On the other hand, we now know that making ultra-super-duper-mega-high-res screens is totally possible. So.. cool, I guess? If 10K televisions were available right now, would you buy one? Let’s talk about that.